Weather is always on the forefront of our minds. It affects what we wear, our plans—it can even affect our moods. If you’re a brand, there’s a good chance that it has an impact on your sales. In fact, the NOAA estimates that at least 1/3 of the US’s GDP is climate sensitive. Even though weather has always been on the minds of businesses, targeting by weather is only recently becoming a trend. Not only is weather targeting a way for marketers to leverage various conditions to increase sales and “make hay while the sun shines,” but it’s also a great opportunity to make a more meaningful connection with their customers and attach brand awareness within the customer’s immediate environment. If a marketer can serve an ad that says “it’s 45 degrees and sunny out today, but this weekend we’re expecting your area to receive 10 inches of snow—today’s the best day to get those new snow boots you’ve been meaning to buy,” the message is likely to hit home with consumers who need new boots. A large reason why this type of targeting is only now becoming popular is because until recently, there were technical limitations that prevented doing it at scale. Much of the targeting that has traditionally been available to digital marketers is based on cookies. Weather doesn’t fit that mold because it changes much more frequently than cookies are updated. Additionally, it’s based on user location, which also changes as people go about their lives. 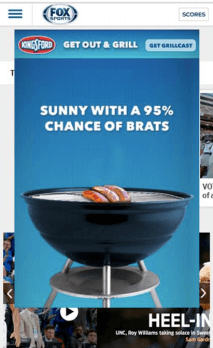 One brand that has successfully incorporated weather targeting into their digital campaigns is Kingsford Charcoal [Clorox-CLX (NYSE)]. During a recent spring campaign, they partnered with WeatherAlpha, a data provider for weather-related targeting, to find the most beneficial way to incorporate weather into their marketing campaigns. Since people grill when the weather is pleasant, Kingsford wanted to pinpoint what constituted “good grilling weather” within each region of the country. Prior to campaign launch, they worked with WeatherAlpha to analyze their first party data to identify which types of weather conditions had the greatest impact on their customers’ decision to grill. Using this analysis, they then created custom weather targeting rules. 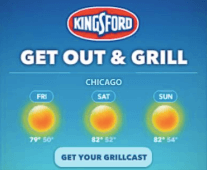 Depending on the weekend’s forecast conditions within each zip code, Kingsford worked with Eyeview to dynamically serve ads which gave the consumers their “grillcast” and displayed which days were best for grilling. Kingsford also leveraged custom weather targeting in other ways. They launched a weather-triggered CRM campaign for users that displayed different messaging, depending on which zip code each user lived in. They also created a weather-responsive homepage, which mirrored their display campaign. On the homepage, users were able to view the current weather within their zip code. Then, they had the option to click through to get their “grillcast” for the upcoming weekend. Using the weather to Kingsford’s advantage allowed the brand to serve more timely and meaningful messages to their customers. The results from a corresponding comScore study showed significant lift in awareness and intent to purchase. If you’re a brand or agency that has been considering the impact weather-based marketing can have on your marketing, technology has evolved to allow many creative ways of incorporating it—especially since each business has its own unique set of weather conditions that affect their customers’ behavior. Plus, your customers might thank you for it!